The world's third largest oilfield services company Baker Hughes Inc. plans to slash 7,000 jobs due to reeling oil prices, which are pushing big oil to cut production and new projects. 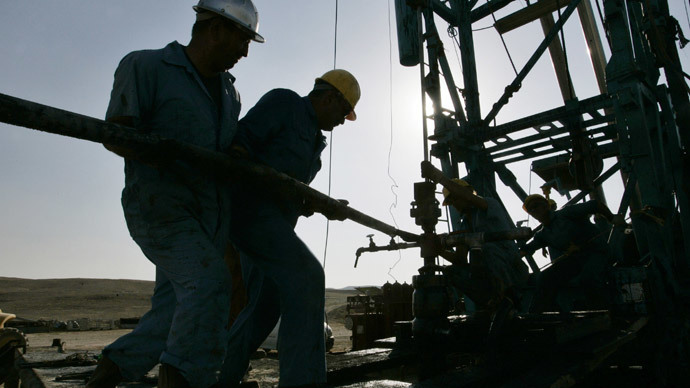 “This industry can’t simply hope and wait for oil to climb back over $100 a barrel. Instead, we must adapt to a new reality of sustained lower commodity prices,” Martin Craighead, CEO, said during a conference call discussing 4th quarter earnings on Tuesday. West Texas Intermediate crude oil, the most common blend in the US, is priced at $46.40, less than half its value in September of 2014. Bank of America has forecast oil could drop as low to $31 per barrel in 2015. "What we’ve learned in the past is that when the market turns down, it turns swiftly. In each of the last three downturns dating back to the nineties we see North American rig counts fall between 40 percent and 60 percent in the space of only 12 months," the CEO said. Baker Hughes, which specializes in drilling and production optimization, will lay off 7,000 employees during the first quarter of 2015, despite good fourth quarter results. The massive cuts follow rival Schlumberger’s decision to lay off 9,000 employees, part of a $1 billion restructuring plan that also includes retiring vessels. Across the US, more than half a million are employed by the oil or oil service industry, and that sector added 12,000 jobs in 2014. Jobs are most densely located in oil-producing states Texas, Alaska, California, Kansas, North Dakota, Oklahoma, Ohio, Pennsylvania, Colorado, Arkansas, Wyoming, Utah, and West Virginia. Some states like Alaska are nearly 100 percent dependent on oil revenues, so a slow down or cut in jobs would be felt immediately. One in three wages in Alaska is linked to the oil industry. The oil downswing brought Baker Hughes and its formal rival Halliburton together in a merger, announced in November, when oil was still trading at $75 per barrel. Halliburton bought Baker Hughes out for $34.6 billion. The two Houston-based companies have a total of 15,000 employees in Houston. An estimated $200 billion debt looms over American oil and petroleum companies, especially shale companies which have sunk billions of dollars into new projects while oil was at record highs. Despite low oil prices, the company recorded $6.64 billion in fourth quarter 2014 revenue, spurred by both its domestic and international presence. The company’s US pressure pumping margins are the highest in 3 years. The company has restructured its international portfolio to be in a stronger position, exiting projects in Iraq and Libya, as well as significantly pulling out of the Venezuelan market. Profits in Brazil, Norway, Angola, and the Middle East remained strong.